Summary: Growing up in a poor Christian home in communist Romania brought its own kind of suffering for Elena. Losing both her grandfather and father also took a toll on the young girl. With nine children to raise, Elena's mother was encouraged to send some of the children to boarding school, especially as the state had confiscated the family's land. At the age of eleven, Elena was sent to a distant state boarding school where she endured loneliness, ridicule and abuse. As she grew older, Elena found her niche in running. The Christian teaching she had received at home faded to the background as she trained with a vengeance to become the fastest runner in Romania. Her goal seemed close, when God's loving call changed her life's course! After making a total commitment to Christ, Elena was kept under surveillance by the communists due to her involvement in children's work in the church, contact with foreigners and Bible smuggling. Nevertheless, she was determined to work for the Lord. Finally, she tried unsuccessfully to escape from Romania twice. The second attempt landed her in prison. 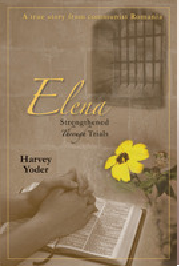 There, although suffering many hardships and more ridicule, Elena found that our sovereign God can use trials to strengthen His children and increase their faith in Him. Finally, through pressure put on the government by foreign Christians, Elena was released from prison and later permitted to emigrate to the USA. Message: God is able to give us strength to endure the worst of circumstances. If we rely on other people, no matter how godly they are, God will often place us in situations where we learn to rely solely on Him.